I had once tweeted that the only thing remaining between Virat Kohli and ultimate batting greatness is his vulnerability outside the off stump. I knew I was being a bit dramatic here, but you know what, there were a few sceptics out there who kept bringing up the fact that he averaged just 13 in four Test matches in England, and how he kept nicking the ball to the slips, especially off Jimmy Anderson. Something about performing in England. To be acclaimed as a true great somehow you have to put up a good show in England, maybe it is because cricket in the summer of England gets global attention. But, I see a cricketing reason for it. It is like in tennis, a master of clay courts has to win the odd title on grass to show that he is not just a great player in conditions that suit him. English conditions are alien to batsmen who are brought up on hard pitches where the ball skids on to the bat nicely. On these English turf pitches, the ball tends to just hold into the pitch and change direction. A very subtle occurrence that has a big impact on a batsman’s performance. So, now that Virat has a 100 in England, the sceptics will nod their head and say, “hmm... he is special, this guy”. India is an amazing country in this regard. We had Sunil Gavaskar in the 70s and 80s—the undisputed batting great. When he packed up, in just two years, we had another batting great in Sachin Tendulkar. While Tendulkar’s long career was winding up, the brick and mortar was laid for another Indian great that the cricketing world could marvel at—Virat Kohli. My theory is that Indian batsmen play so much on flat pitches that they end up playing long innings from a very early age, as early as 12 and they do play a lot of matches. So, when an Indian batsman reaches the international stage, at say, age 20, he has faced and hit three times more balls than a batsman of the same age from England, New Zealand, South Africa or Australia. After that, the only hurdle is adjustment to different conditions. Once you are able to do that, the advantage of the batting hours kicks in, and, lo and behold, we have another Indian batsman ruling the world! 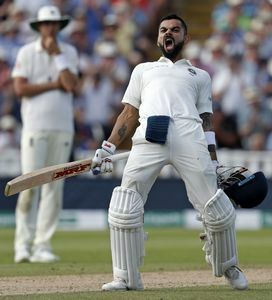 For one of the greatest stroke players in the world, Virat’s first 100 in England was about not playing strokes. He had to fight off his biggest threat, Jimmy Anderson, by reining in his natural instincts of playing shots, especially his favourite, signature shot, the cover drive. When he reached his 100, Virat had deliberately left 40 balls outside the off stump, out of which 26 were off Anderson alone. That is more than four overs of Anderson. Can you imagine that? This is a modern player, where in one format he has to belt every ball for a four or six, in the other score off every ball, but come Test cricket, he was able to do the extreme opposite. And, that was the real hallmark of that Virat 100. Sure, he was dropped on 21, when for once he was sucked into the England trap, but like great batsmen do, he made the opposition pay a heavy price for it. This is all very nice—Virat’s dominance and all that—but, what about India the team? What about India replicating its home performance overseas? Well, that issue still remains. And for that, at least on this England tour, Indian batting cannot be a sole proprietorship, for in a competition between a team and an individual, even if that individual is Virat Kohli, the team will generally win.